Here's a visual of that family tree (which features the aforementioned John of Gaunt in a prominent position). If the U.K. is trying to convince us that everyone on its main isle doesn't know each other, then it's not doing a very good job. 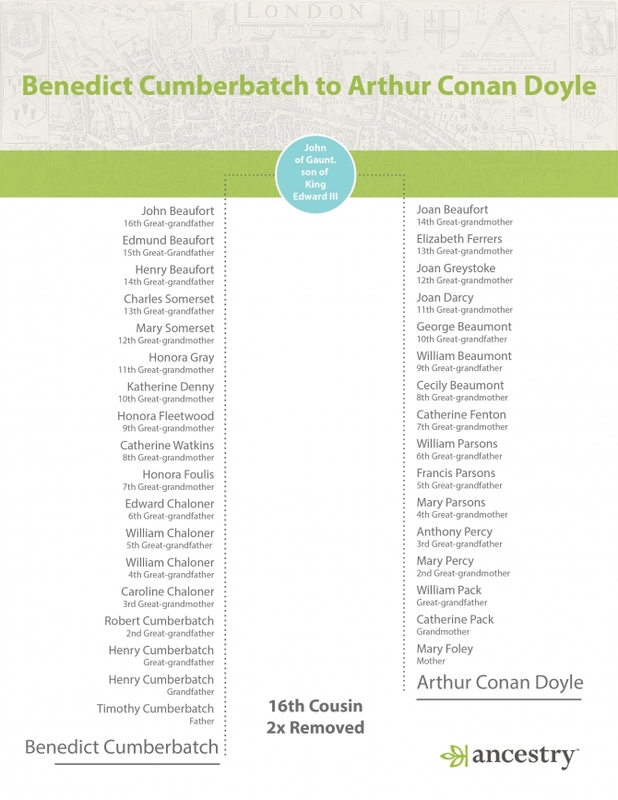 Ancestry.com just did a little research to discover that Sherlock star Benedict Cumberbatch is related to Sir Arthur Conan Doyle, the author of the Sherlock Holmes stories. How related are they? I guess it's all relative (pun! ), but they are close enough in the family tree to fit on a visual. They are 16th cousins, twice removed with a common ancester named John of Gaunt, who was the son of King Edward III. John of Gaunt who was the duke of Lancaster, the fourth son of King Edward III of England, and lived way back in the 14th century. Conan Doyle died in 1830. Cumberbatch is currently 40. 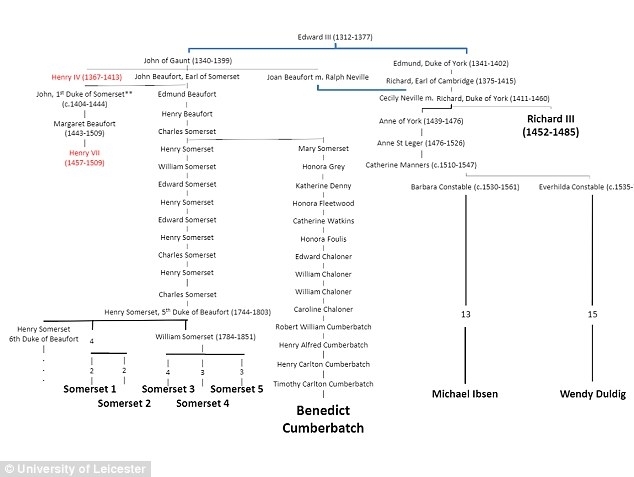 For those keeping track at home, John of Gaunt was Doyle's 15th great-grandfather and Cumberbatch's 17th great-grandfather. "Making family history connections is similar to piecing together a mysterious puzzle, one that the great Sherlock Holmes himself would be intrigued to solve," said Lisa Elzey, family historian at Ancestry.com, in a statement. Ancestry.com sure does know its business - and how to create a buzzworthy ancestry story. 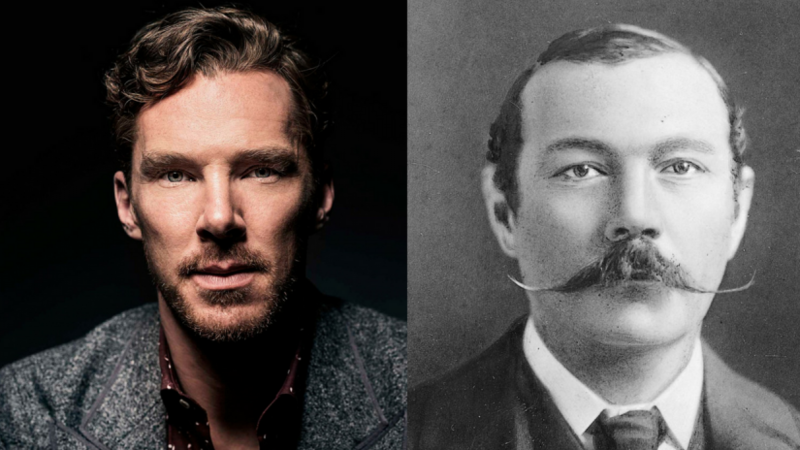 This isn't the first time Cumberbatch has found himself distantly related to a character he is playing. Cumberbatch played murderous English tyrant Richard III in the BBC's The Hollow Crown series and, according to scientists (via The Guardian), the actor is also related to the English royal. In terms of number of generations, the shortest is via Richard’s mother Cecily Neville’s grandmother Joan Beaufort. He also has more indirect links to both Queen Elizabeth II and Lady Jane Grey through other ancestors in his tree. Credit to Kayti Burt of DenOfGeek.com. Source.